To lessen the risk of power outages, Dominion Virginia Power has trimmed some trees in the area. One result is some free firewood under the power line behind the playground of Ft. Myer Heights Park. Here in Westmoreland we don't have any fireplaces, but maybe somebody with a beach house or a friend with a fireplace could use the wood. 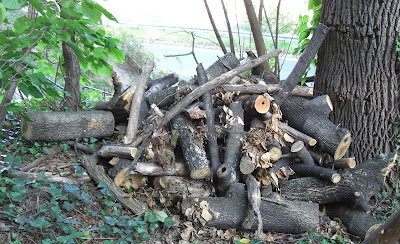 The total amount of wood would just about fill the back of a pick-up truck (there are several other piles in addition to the one pictured above). To make arrangements to pick up the wood, it would probably be best to contact the Westmoreland Condo manager, Phil Bogert.